When setting up my current studio I looked for changes I could make to reduce my carbon footprint. Given that I live in the Pacific Northwest where most of our electricity is generated with hydro-power and wind, converting from gas to electric firing seemed sensible. Not a big change in the grand scheme of things, but I need to get the clay hot somehow if I’m going to continue as a potter. My handbuilt ‘celadon’* glazed pieces are a continuation of a thirty-year-long exploration of texture as narrative. This kind of texture is created by marking the clay slab with rolling stamps I have carved. 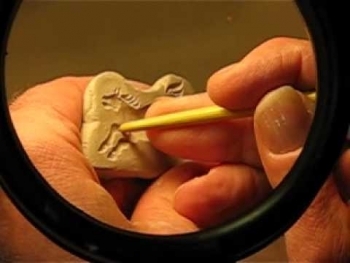 Little images are then applied to the surface from tiny carved molds, rather than stamped into it. These are called “sprigs” and I continue carving new ones; the cast of characters and backgrounds gradually expand. Watch the slide show below to see how I texture the slab and then form it into a cup. *Technically celadon is produced by firing iron oxide in glazes in a reduction atmosphere, using a fuel. My ‘celadons’ are fired in oxidation using electricity and multiple metallic oxides. Lately I’ve expanded this approach from cups to larger pieces, but the heart of the matter, the place where change seems to originate in my work, is in the cups and yunomis where I hope the imagery that appears at the tips of my fingers will give the users of these pieces the opportunity to hold an ever-changing story in their hands. Another process called Mishima has lately pulled me deep into complex imagery. 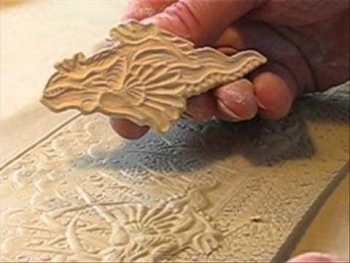 This is a technique which involves drawing with a stylus into leather hard clay, filling the incised lines with a dark slip, allowing it to dry a little, then scraping away the excess to reveal the drawn line. My variation is to then add washes of metallic oxides to achieve shading from dark to light. When I begin a drawing I have a vague plan for what I intend, but mostly I let the images take the lead and reveal their meanings in the hope that each piece will become its own little world. I’m always ready for a surprise. This method gives me a chance to draw on my pots with a sensitivity very different from brush work. Brushes are quick and loose. Mishima is a draftsman’s labor of love. The video below shows how I use this technique. I have not abandoned the bark-textured pieces that for many years were my take-off point for sculptural work, but these days I find my utilitarian pieces are taking me in directions that inform one another in ways I can never predict. The utilitarian stoneware pieces I make, mostly vases, bowls, handbuilt plates and some cups, are opportunities for me to paint with glaze and produce durable pieces that are attractive, easy to understand and comfortable to use. 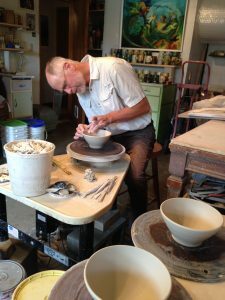 Working this way gives me a chance to hang out with my old friends, the potter’s wheel and the paintbrush, and allow the process to show me something new, which it always does if I pay attention.